For whatever reason, when traveling, it's often the very young or the very old who are the most memorable people to meet. 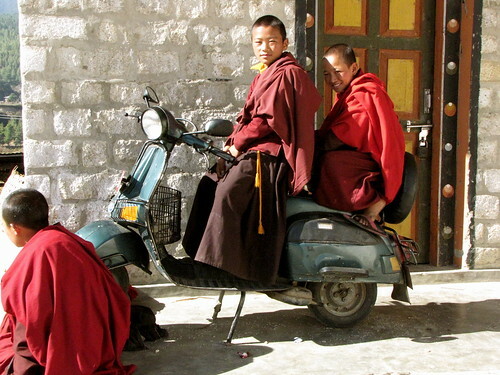 This sad little monk on the Vespa kind of broke my heart. 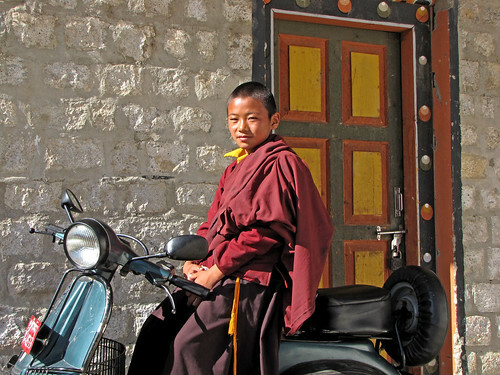 He was sitting outside Tamshing Lhakhang with a couple of other boys. In contrast to the other temples and monasteries we visited, this one had an atmosphere of dereliction. It is a Nyingma temple, which is not the state Buddhist school of Bhutan, therefore it does not receive funding. The conditions here are austere indeed and the historical artwork is deteriorating. Of course, I asked my guide to ask this monk's permission to take his photo. He gave it with a silent nod. Unlike almost everyone else I met, he did not smile.